Description of the AMS-LNS collaboration on the MIT LNS web site. Professor Ting received the Nobel Prize for the discovery of the J particle at Brookhaven National Laboratory, as well as numerous other prizes during his career. His further seminal results include: observation of nuclear anti-matter (the anti-deuteron); measurement of the size of the electron family (the electron, the muon, and the tau) showing that the electron family has zero size (with a radius smaller than 10-17 cm); precision study of light rays and massive light rays showing that light rays and massive light rays can transform into each other at high energies and providing a critical verification of the quark model; precision measurement of the radius of the atomic nuclei; discovery of the gluon (the particle responsible for transmitting the nuclear force); a systematic study of the properties of gluons; a precision measurement of muon charge asymmetry, demonstrating for the first time the validity of the Standard Electroweak Model (Weinberg, Glashow and Salam); and determination of the number of electron families and neutrino species in the Universe and the precision verification of the Electroweak Unification Theory. He developed the first large superconducting magnet in space and has demonstrated separation of helium isotopes in space. Currently, he is leading a 15 nation, 500 physicist international collaboration to use the U.S. International Space Station (ISS) National Laboratory to probe fundamental questions of modern physics including the antimatter universe and the origin of cosmic rays and dark matter. Autobiography for The Nobel Foundation. 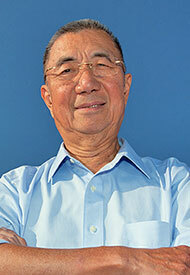 Professor Ting's publications are available on the SPIRES HEP Literature Database.